Zach Clark has a very Zen-like approach on the mound. Friday's outing played right to his strengths. The Orioles farmhand pitched a three-hitter for his first career complete-game shutout as Triple-A Norfolk beat Gwinnett, 4-0, at Harbor Park. Clark (5-2) needed only 95 pitches and less than 2 1/2 hours to finish off the Braves. Signed as a non-drafted free agent in 2006, he struck out five, did not walk a batter and recorded 14 outs on the ground. "I had a good sinker tonight," said Clark, who retired the final 14 batters. "It was moving, I could tell it was moving. I just seemed to get ahead of guys and they hit a lot of ground balls. [Catcher Ronny] Paulino has a good feel for what he's doing back there. It was easy for me -- he put down signs and I put down the pitches." Friday's gem was just the icing on the cake for Clark. 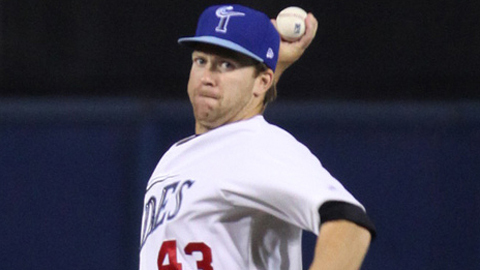 The 29-year-old right-hander ranks second in the Minor Leagues with 15 wins between the Tides and Double-A Bowie. He's recorded a career-high 98 strikeouts while compiling a 2.79 ERA in 28 games. The secret to his success is a return to a specific routine. "It took me a while to figure out that what I was good at was good enough," the Delaware native said. "I'm not a hard thrower and I always felt like if I threw a little harder I could get more attention. Last year, I changed my mechanics and it seemed to work at the beginning. But when things went wrong, I didn't know how to adjust." "I've always done dry work, but now it's encouraged and it gave me comfort in doing it. It's part of the routine and I like routines. It's just throwing without a ball pretty much. It helps you get a feel for what it feels like when things are where they should be and for when they shouldn't be." Clark prefers to pitch in games that move along quickly, so Friday's outing was right up his alley. "Sitting between innings is torture for that long," he said. "I just want to pitch, I don't want to sit there and wait. This game had a pretty good flow, the game was going quick, and I like that. I don't mind pitching in games that have a rhythm to them. When I'm pitching, I don't think about anything; and in between innings, I think about everything." Considering the year Clark has had and with the end of the Minor League season fast approaching, it's only natural to think about a September callup. "I think about it every day," said Clark, a product of the University of Maryland-Baltimore County. "I don't know, they've got so many guys pitching well I just hope that I gave them a tough decision to make. To go up there and pitch would be unbelievable, especially given that they are in a playoff run. I just think that there are so many guys doing well that it would be awesome, but I don't count on it." Paulino supported his batterymate with two hits and an RBI, while Jamie Hoffmann slugged a solo homer for the Tides. Joe Mahoney, the Orioles' No. 14 prospect, went 3-for-3 with a double.